The initial video that explains the HoloLens to the world contains a small clip that visualizes how it can see the environment. It shows a pattern of large and smaller triangles that gradually overlay the real world objects seen in the video. I decided to try to rebuild this effect in real life by using a projection mapping setup that used a projector and a Kinect V2 sensor. First I experimented with the idea by prototyping a pixel shader in Shadertoy. Shadertoy is an online tool that allows developers to prototype, experiment, test and share pixel shaders by using WebGL. 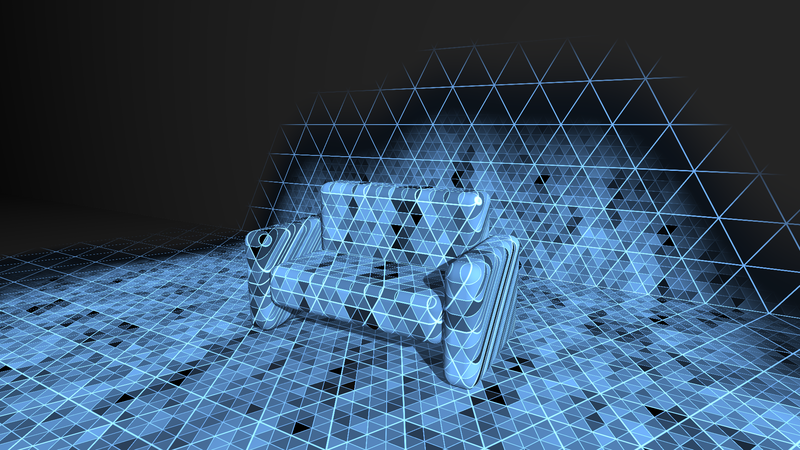 I started with a raymarching example by Iñigo Quilez and setup a small scene with a floor, wall and a bench. The calculated 3D world coordinates could then be used for overlaying with a triangle effect. The raymarched geometry would later be replaced by geometry scanned with the Kinect V2. The screenshot below shows what the effect looks like. The source code of this shader can be found on the Shadertoy website. During Build 2015 Microsoft open sourced a library called the RoomAlive Toolkit that contains the mathematical building blocks for building RoomAlive-like experiences. The library contains tools to automatically calibrate multiple Kinects and projectors so they can all use the same coordinate system. This means that each projector can be used to project onto the correct location in a room. This can even be done on dynamic geometry. The toolkit also includes an example of reprojecting the recorded image with a pixel shader effect. I used this example to apply the earlier prototyped scan effect pixel shader onto a live scanned 3D geometry. The installation was shown at the Bring Your Own Beamer event held on September 25th 2015 in Utrecht, The Netherlands. For this event I made some small artistic adjustments. 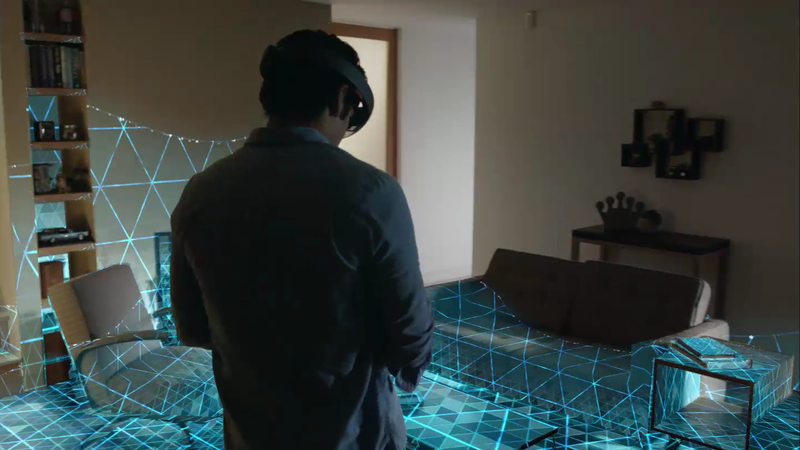 In the original video the scanning of the world seems to start from the location of the person wearing the HoloLens. In the installation shown at the event people were able to trigger the scanning effect with their feet. The effect starts at the triggered location and expands across the floor and up their legs and any other geometry in the room. The distance from the camera determines the base color used for a particular scan. Multiple scans interfere with each other and generate a colorful experience. The video shows how part of the floor and part of the wall are mapped with a single vertically mounted projector. People seemed to particularly like to play with the latency of the projection onto their body by moving quickly. Roland Smeenk © 2019. All Rights Reserved.